Hall Piano Fall Semester Begins with Open House and Complimentary Piano Lesson Saturday, August 29th. Before the hustle of the new school year begins, families can discover the Hall Piano Company Music Academy’s 2015 Fall Open House on Saturday, August 29th from 10:30am-2:00pm. “It’s the perfect time to evaluate your child’s interest in learning the piano in a fun atmosphere,” said Steve Kinchen, co-owner of Hall Piano Company. Kids can experience a complimentary trial lesson and meet the Academy teachers. 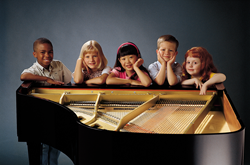 The Music Academy provides an opportunity for kids of all ages to explore music through the piano. From pop, jazz and classical to gospel, praise/worship and improvisation, our musical educators help their students discover abilities, set goals and enjoy the musical learning experience. Steve Kinchen, co-owner of Hall Piano Company, said, “The Open House is our chance to give back to the greater New Orleans community that has supported us since 1958. Through discounts on our method books and lesson packages, we hope to create opportunities for every child to explore their interest in music.” In addition to piano lessons, Hall Piano’s services include piano rentals and sales, acoustic and digital piano sales, and method books. Adult lessons are also available. Hall Piano Company is Louisiana’s premier Steinway & Sons dealer. For additional information about the Open House or available services, contact Emily McWilliams at emilym(at)hallpiano(dot)com or call 504.733.TUNE.